Finally, a chance to break out of the lab and enjoy a welcome change of scenery. Halfbrick, the developer behind the smash hit Jetpack Joyride, released a new update that is without question the greatest yet. 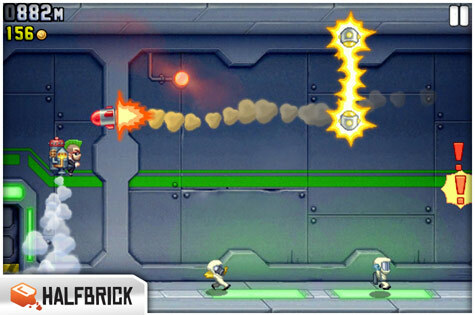 In the game, players guide a jetpack wearing Barry Steakfries through a top secret lab, spitting bullets at hapless scientists while grabbing gold coins and avoiding hazards. Mission System: Help Barry earn all 125 prestige badges with a variety of new and exciting challenges for you to tackle. Forest Environment: Leave the lab behind and enter a tranquil and enchanting forest to continue Barry's coin collecting, havoc wreaking and time travelling adventures. New Achievements & Store Items: Collect a new selection of items such as a Super Head Start power-up and new Kingly clothes for Barry. Minor bug fixes: Because that's how we roll. We've been huge fans of this game for a while, and it's great to see Halfbrick's continued support, but beware. Updating the game may delete your progress.